I began to develop an interest in the game at ten years of age. My Dad and his family always had a great love and passion for the game. He took me to a local driving range where I was approached by the local Golf Professional. He asked me if I would compete in a few junior activities that night, simply to even out the numbers. I won myself two movie theater tickets and I couldn’t wait to return the following week. Fun at T&CP Level 1! The first day of the Level I program towards LPGA T&CP certification started off with an energizing cheer! Watch a highlight in the video below. May 18, 2016 marked the ninth annual National Golf Day on Capitol Hill in Washington, D.C. This year’s event featured LPGA legend Nancy Lopez, 2016 U.S. Ryder Cup Captain Davis Love III and Vice Captain Steve Stricker. Golf industry leaders met with members of Congress, the Executive Branch and federal agencies to discuss the game’s nearly $70 billion economy, $4 billion annual charitable impact and many environmental and fitness benefits. Throughout the day, participants shared stories about the game’s nearly 15,000-plus diverse businesses (there more golf courses than McDonald’s in America), the two million jobs that are impacted by the industry, tax revenue creation, tourism and ecological value. Originally published by Green Valley News (GVNews.com) on May 15, 2016. Written by Christopher Boan. 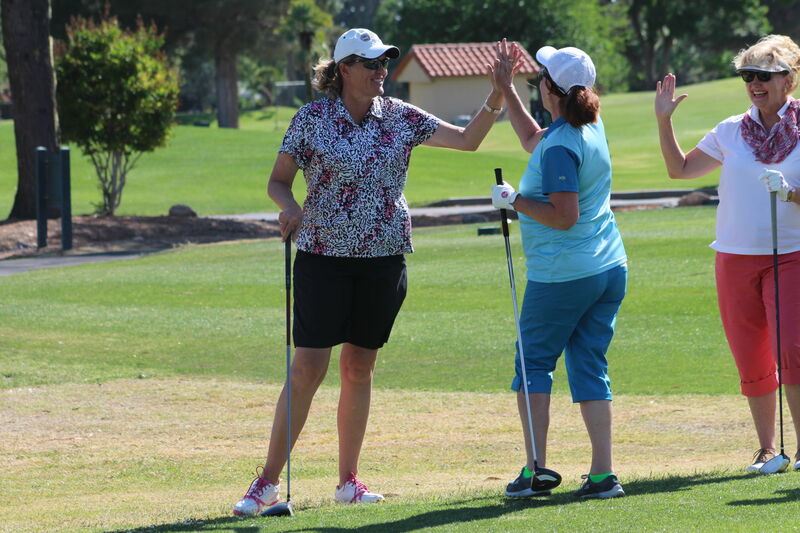 It’s a toasty Friday in April on the sun-baked grounds of Haven Golf Course in Green Valley, where a small group of women will soon discover a love for golf — at least if their teacher has anything to say about it. She’s longtime Haven teaching pro Marvol Barnard, whose influence and reputation reach across the nation. But who’s most at home right here. Barnard, 57, guides the women through each shot in meticulous detail, ensuring they’ll catch the same bug she did two decades ago when she learned the game on the same grounds. The foursome is part of an introductory Golf 101 class sponsored by the Arizona Women’s Golf Association that Barnard lovingly refers to as “the loop” because they play the same holes (10, 11 and 12) each week. Barnard knows how hard it is to get new golfers to stick with the sport. Linda Vollstedt Named Pac-12 Coach Of The Century! On Monday night, the Pac-12 Networks’ flagship show, ‘Pac-12 Sports Report,’ revealed Hall of Fame head coach and current Sun Devil Athletics Development Director Linda Vollstedt was named the Pac-12 Women’s Coach of the Century. In Vollstedt’s 21-year tenure at Arizona State, she led the Sun Devils to six NCAA Championships — more than any other program in the country, at the time, and the only program to win three in a row — nine conference championships and four individual national championships. She also coached 41 All-Americans, 12 conference medalists, 71 All-Conference golfers, 15 Academic All-Americans and 11 U.S. Amateur and Public Links Champions. Congratulations Jennifer Alexander on being selected for the inaugural 2016 Golf Academy of America – Top 100 Alumni List. Jennifer graduated from the San Diego Golf Academy, now called the Golf Academy of America, in August 2004 as the valedictorian. Jennifer has been recognized as a distinguished Golf Academy of America alumnus by her fellow graduates and faculty for her outstanding achievements in the golf industry. We congratulate Jennifer for her commitment as an LPGA Golf Professional and to promoting the game of golf.